This is my first time reading a book in this series. I enjoyed reading this chapter book that is perfect for beginning readers who love dogs. Lizzie and Charles are two siblings who really want a dog, but their mom favors cats and feels that their family is not ready to shoulder the responsibility of caring for a dog. One day, their father, who is a volunteer fireman, rescues a golden retriever puppy from a fire. The children plead with their parents to keep the pup. 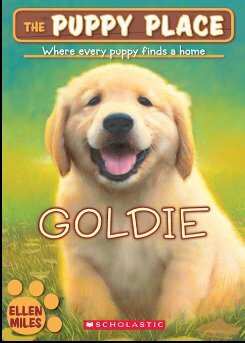 When their two-year-old brother falls in love with “Goldie,” and follows her everywhere, mom reluctantly agrees to adopt the dog temporarily as a foster pup. Lizzie researchers how to train puppies and Charles helps out with socialization training. Mom insists that they advertise in the community for a permanent placement, and the children reluctantly agree. They come up with a plan to keep the pup nearby. In the end, the family is surprised at how this golden retriever has transformed them. This chapter book is charming; it tells the story from the viewpoint of the children as well as in the first person from the viewpoint of a puppy. In the process, children learn responsibility and the proper way to care for a puppy. Recommended especially for readers ages seven through ten, but the tale can be enjoyed by all ages.